During this time of year we come together to celebrate with friends and family. With so many gatherings it is easy to over indulge in foods that make us feel sick and tired. Buy adapting classic recipes with wholesome ingredients you can maintain your health and enjoy the party. 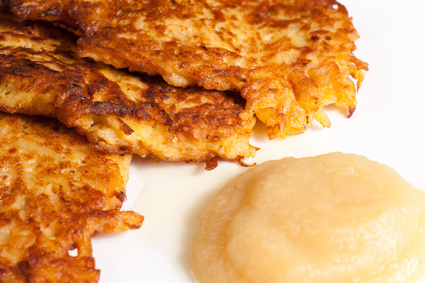 These crispy fried potato pancakes are served on Hanukkah, but they can happily be enjoyed year round. Traditionally they are served with sour cream and applesauce, but any dip or spread may be used. There are a multitude of different adaptations and recipes. This is my current favorite and it is gluten free. – ¼ cup each butter and olive oil – you may use any heat stable oil, but I like this combination. Refined, non-hydrogentated palm oil (sold as “organic shortening”) also works well. In a large mixing bowl beat together the eggs, salt and flour. Peel the potatoes and the onion. Grate the vegetables in a food processor or by hand. Place the vegetables in cheese cloth over a bowl and press out as much liquid as you can (if you don’t have cheese cloth use a mesh strainer). The potato starch will settle at the bottom of the bowl. Pour off the liquid on top and add the starch and grated potatoes and onions to the egg mixture. Stir everything together until it is well blended. Heat 1 tablespoon each of butter and olive oil in a sturdy skillet. I like using a well-seasoned cast iron pan for this. The oil should be hot but not smoking. To test the temperature drop a small amount of batter into the oil; if it browns within a minute the pan is ready. Spoon the batter into the oil ½ cup at a time and flatten each pancake with the back of your spatula. Cook the latkes for 4-5 minutes, until the edges are very brown and then flip them over and cook them on the other side for 4-5 minutes. Remove them from the pan onto a plate lined with a paper towel. Cook the rest of the pancakes adding oil as needed to keep a thick layer to the bottom of the pan. These are best served hot, but they can be kept warm in the oven for a few hours. Leftovers can also be reheated in the toaster oven. 1) If you are using a food processor you can add ½ of the grated potato and onion mixture back into the processor and coarsely chop it with the chopping blade. Then mix the chopped potatoes with the grated potatoes and press out the liquid as directed above. This makes a finer batter that holds together well. 2) You can replace 1 cup of the potato mixture with 1 cup of any grated vegetable such as carrots, zucchini, or yam. 3) For vegan latkes replace the eggs with 2 tablespoons of finely ground flax blended with 2 tablespoons of water. Omit the flour. Be sure to fry these crispy. The flax can be gummy if they are undercooked. Rich molasses with sweet, spicy ginger, the smell alone brings back holiday memories. This recipe is low in sugar and gluten-free, but it doesn’t compromise on flavor. Remember that whole grain flours need to be sifted before use or your final product will be heavy. Preheat the oven to 350 degrees F. Sift together the oat flour, ½ cup of rice flour, arrowroot starch and baking soda. In a separate bowl cream together the butter, molasses, spices and salt. Pour the flour mixture in to the butter mixture and blend them well. The dough should be smooth and soft. Chill the dough for at least 1 hour before rolling it out; you may store it overnight. Divide the dough into two pieces and flatten one into a disk. Place it on a floured piece of parchment paper. Then dust the top with flour and place another piece of parchment paper on top. Roll the dough out ~ ¼ inch thick. 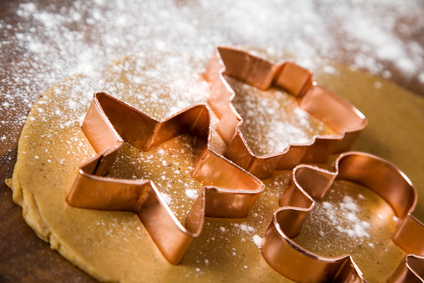 Remove the top paper and cut out the dough with cookie cutters. If the dough seems too sticky your can work a little extra rice flour into it. You can make classic gingerbread men or any other shapes that you desire. Place the cookies onto a parchment lined cookie sheet and bake them for ~ 8-10 minutes depending on the size of the cookies. Cool the cookies completely before decorating them with dried fruit, nuts and jam. These cookies keep over week in a sealed container if undecorated.